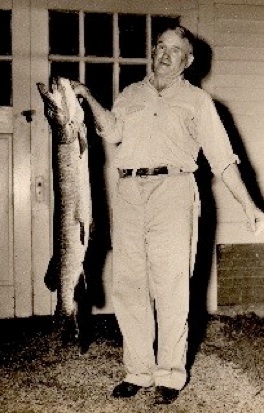 Clair Winship holds a muskellunge he caught in Chautauqua Lake, sometime in the 1950′s. I recall seeing photos of larger muskies, but this one will give you an idea of what my grandfather could do with a bamboo fishing pole from a rowboat. One of my favorite things about this picture is the bandage on the index finger of his left hand, probably from a fish hook, although it could have been from the teeth of the fish itself. Grandpa used to cut off the fish heads and mount them above the garage doors he’s standing in front of in this photo; he painted the heads silver and the teeth red. They were some amazing pieces of folk art; I wish I had one. The picture may have been taken for the newspaper in Bemis Point; they once hung one of Grandpa’s fish in the front window for several summer days. Grandpa then brought it home, dropped in across the kitchen table and said to his wife, “Abbie, clean this.” She replied, “No, Clair, you bury it.” Which he did.